I met my wife 21 years ago this week. We were attending Boston University. I like to think it was love at first sight for both of us… but the truth is… it was a slow and smoldering love. I grew to love her smile, her selflessness, her dedication, her cooking… oh that cooking. Throughout the years we began our careers and all along the way that smoldering love was there. So was that cooking oh that cooking… chicken soup, crescent rolls, cookies… oh my that pumpkin pie. Throughout the years we got married and began our family and all along the way that smoldering love was there. So was that cooking oh that cooking: mashed potatoes on Thanksgiving with heavy cream and butter… oh lord that’s good. Throughout the years we grew into this new phase of marriage.. Gray hair for me… she still looking twenty two… and all along the way that smoldering love has been there. So has that cooking oh that cooking: her chicken pot pie with the flaky crust and warm chicken and veges inside… oh my that pie. And today on a random Thursday… I woke up to a divine smell in the house. The wife told me to check the kitchen. And I did. I went in and there it was… sitting on the stove with an angelic glow… and harp music in my head… her famous chicken pot pie… made from scratch… just for me. 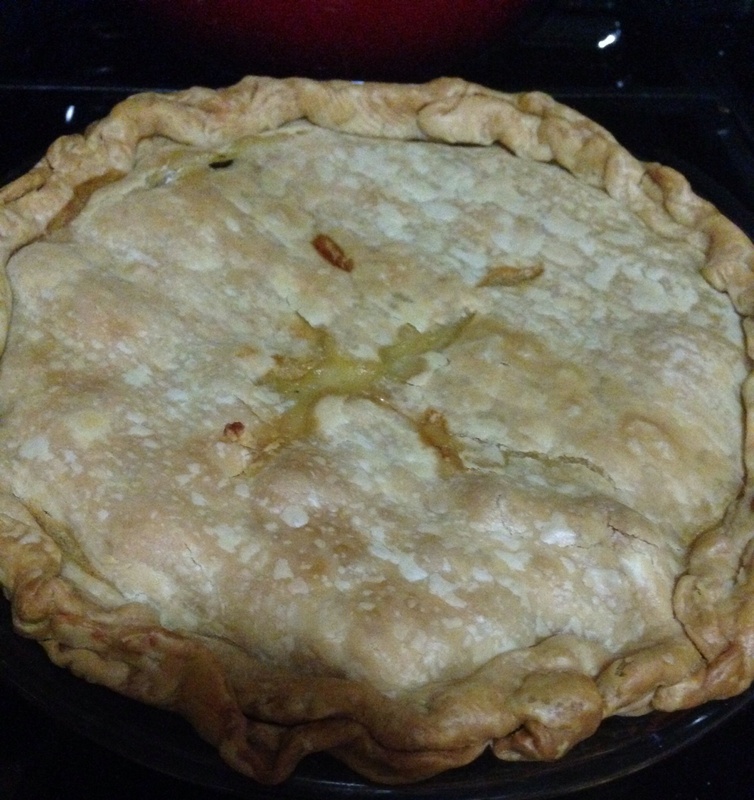 My own pie… oh my my my. And then, reassurance once again… that our love continues to smolder. I’ll stick a fork in that pie… but we’re far from done. This entry was posted in Uncategorized and tagged cooking, Dadmissions, marriage, pie, wedding. Bookmark the permalink.